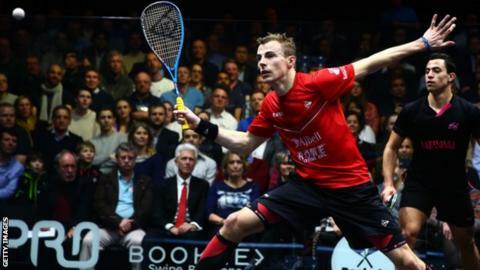 Britain's three-time world champion Nick Matthew is determined to win another major tournament before he retires after May's British Open. As well as his world titles, Matthew has also won three Commonwealth Games golds and three British Opens. "Hopefully I can go out on top," said the 37-year-old. He will link up with James Willstrop, Daryl Selby and Laura Massaro as Great Britain take on the Rest of the World at St George's Hill on Friday. Matthew - plus Willstrop, Selby and Adrian Waller - will then compete in the men's World Team Championships in Marseille, before the World Championships begin in Manchester on 10 December. He said: "We're fortunate to have a World Championships in this country, and then a Commonwealth Games in April which, in the absence of squash being in the Olympic Games, is our biggest thing. "These are the biggest things that I'm aiming at and hopefully I can go out on top. I need to get four of at least one of them. I should call this season 'Mission Four'. "The world individual is the one I've been trying to peak for and having the team event the week before is not necessarily perfect. "The Manchester Worlds go up to a week before Christmas so hopefully it will be a Christmas to celebrate." Matthew is fifth in the world rankings, while compatriots Willstrop, 34, and Selby, 35, are 10th and 15th respectively. The growing force in the world game is Egypt, which has eight players in the top 13 of the men's rankings. Mohamed Elshorbagy and brother Marwan are 26 and 24 respectively and of the others, only Ramy Ashour has reached the age of 30. The top level of the women's game is also dominated by Egyptian players, with four in the top eight. At 22, Nour el Sherbini leads the world rankings from compatriot Raneem el Welily. Massaro, who is fourth, said recently that she is hoping to inspire the next generation of British players - and 23-year-old Emily Whitlock sits just outside the top 10 of the rankings.